Derive fragility curves for existing steel frames with infills and systems retrofitted with BRBs and infills, considering also the effects of earthquake sequences. The HITFRAMES project will also serve to develop pre-normative documents for the seismic assessment and the retrofitting of existing steel multi-storey buildings, which will be adopted as background documents for the revision of steel section of EN1998-3 that is currently under revision. 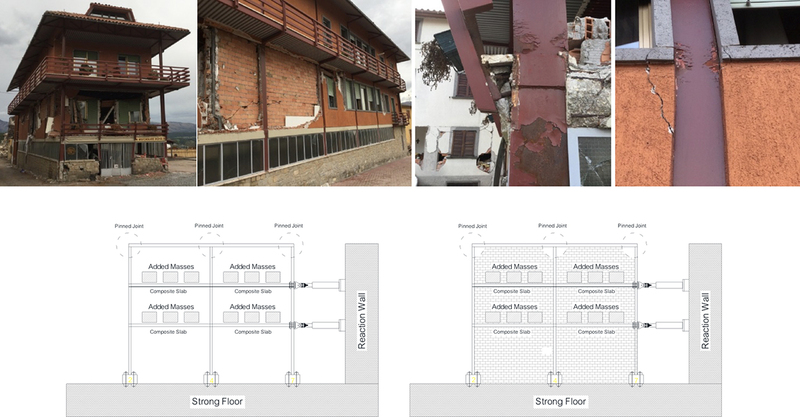 To achieve the above objectives, the seismic performance of a multi-storey steel moment resisting frame (MRF), which was surveyed in the recent 2016-2017 earthquake sequences in Central Italy, will be investigated through pseudo-dynamic hybrid simulations at the Structures Laboratory (STRULAB) of Patras, in Greece. In the first phase, the seismic performance of the reference structure will be evaluated by testing a 2/3 scaled model of a sub-structure with and without masonry infills. Dynamic properties of the bare frame will be estimated with hammer tests and ambient vibrations. In the second phase, a two-storey two-bays sub-assemblage steel frame of the perimeter frame (plane frame, i.e. 2D-system) which includes also the masonry infills, will be retrofitted with BRBs. The 2D-perimeter plane frame will also include the composite steel and concrete slab at the ground and first floors (slab with effective width). Dynamic modal properties of the system will be estimated experimentally. Subsequently, hybrid simulation will be performed on the retrofitted braced configuration, including the masonry infills.